It was during the July 4th holiday in 2010 that executive director Michael (“MJ”) Jaillet, a Dell team member for more than 16 years, experienced the first symptoms: general weakness, fatigue, sore muscles. A few months later, at Thanksgiving, in November 2010, he noticed weakness in his arms and legs. He began what he described as a “medical witch hunt” in January 2011 to figure out what was going on with his body. Carpal tunnel tests. Pinch nerve tests. MRI. Neurological testing. Then, on June 20, 2011, came the first diagnosis: amyotrophic lateral sclerosis (ALS). He sought second and third opinions, and they all concurred. Jaillet had ALS. Because of the viral success of the “Ice Bucket Challenge,” you’ve likely heard of ALS, but may not know a lot about it. There’s nothing that can prepare you for a terminal illness with the probability that you have three years left to live. With voluntary muscle action progressively affected, patients in the later stages of the disease may become totally paralyzed. Life expectancy of an ALS patient averages two to five years from the time of diagnosis. “There’s nothing that can prepare you for a terminal illness with the probability that you have three years left to live,” said Jaillet. Thanks to the “Ice Bucket Challenge” that has taken social media by storm in recent weeks, awareness of this disease has increased dramatically. YouTube cites about 2,330,000 videos related to it, according to Jeremiah Owyang’s compilation of “Cold Hard Facts” on the challenge. 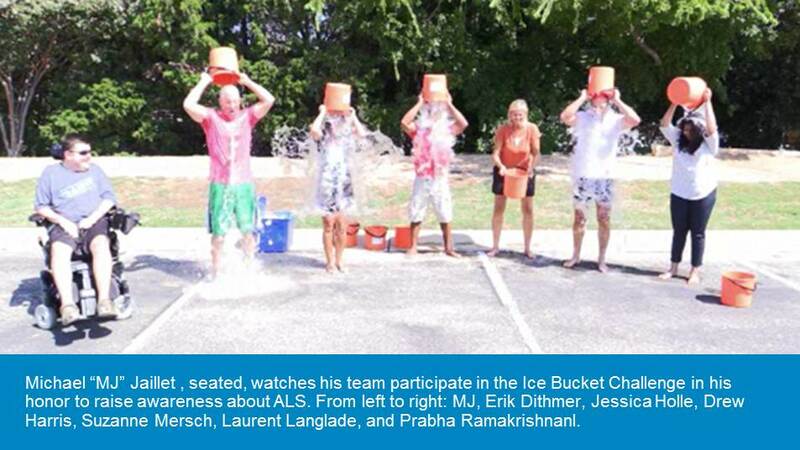 And, you may have even heard Jaillet’s name in our CEO’s personal ice bucket video. Three years ago, however, Jaillet learned about ALS in detail for the first time by living with it. He was surprised to discover that little progress has been made toward finding a cause or a cure, so he decided do whatever he could to change that. By the end of 2011, Jaillet had launched his own foundation to promote awareness and serve others in the community who share his disease. He has since earned a Humanitarian Award from his alma mater, Saint Anselm College in Manchester, N.H., for his efforts. No two ALS cases are the same, and for Jaillet, the disease progressed at a relatively slow rate until November 2013, when he took a fall in his driveway – resulting in a concussion that seemed to accelerate his condition. After 16 “amazing, just amazing” years at Dell, including stints in India, Ottawa, Idaho and Texas, Jaillet is now on disability leave and is confined to a wheelchair. He has ordered an eye-controlled assistive technology device from Tobii (and Dell OEM Solutions) so that he can stay connected to family, friends and colleagues via the Internet.